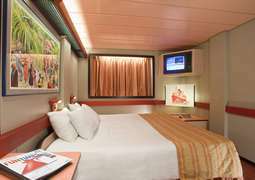 The cabins on board the Carnival Elation are known for their comfortable and relaxing atmosphere. 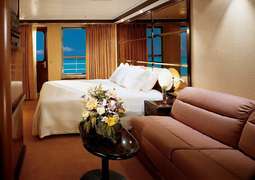 Feel free to choose between inner cabins, outer cabins and suites. No matter whether you're travelling alone, as a couple, family or a group, you are bound to find the perfect accommodations to fit your needs. On board the Carnival Elation there are culinary offerings to please every palate. Indulge in various international specialities in the Buffet Restaurant. For example, watch master chefs prepare delicious Mongolian cuisine in a wok before your very eyes. The à la carte restaurants are home to fine dining in an elegant ambiance. Furthermore you can enjoy fresh pizza and soft ice cream 24 hours a day. The 'Spa Carnival Menu' is a highlight for those looking for light and healthy meal options. 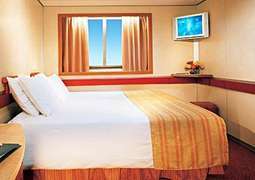 A wide variety of clubs, bars and lounges will keep you entertained while aboard the Carnival Elation. The Mikado Show Lounge has great live music every evening, as well as dazzling Las Vegas-style shows. You may also try your hand at poker, black jack or roulette at the Casino Casablanca. There is always something going on on board this dream ship. Three swimming pools, an impressive waterslide and a special children's pool offer refreshment for guests of all ages. Hit the karaoke bar to perform your favourite songs for friends and other music lovers. Younger guests and teens both have Fun Clubs where they can play, hang out and make new friends. A visit to the duty-free shopping mall is also a must. Let yourself be pampered from head to toe in the Carnival Spa. In addition to a sauna, jacuzzi and steam bath, the wellness area also offers a hair salon and a manicure studio. Sport lovers are welcome to work out in the fitness centre. A 9-hole mini-golf course, a multi-sports square and an athletic track with a wonderful ocean view can all be found on the Sun Deck.